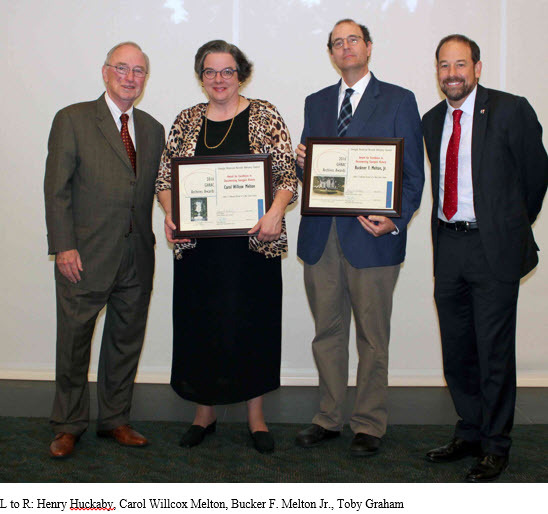 Two Middle Georgia State University faculty members, Dr. Buckner F. Melton Jr. and Dr. Carol Willcox Melton, received the 2016 Georgia Historical Records Advisory Council Award for Excellence in Documenting Georgia’s History during a ceremony on October 26. The GHRAC Awards recognize outstanding efforts in archives and records work in Georgia. The Meltons, who are married and teach history at MGA, earned the honor for the book, 'Fuller E. Callaway: Portrait of a New South Citizen' (Looking Glass Books, 2015). The book, a co-publication of Georgia Humanities and The Callaway Foundation, is a comprehensive illustrated biography of Callaway, whose life years are in direct relationship to the creation and rise of modern Georgia. Callaway was an enduring resident of LaGrange, located in Troup County. He was the personification of not only modern Georgia, but a representative of the new evolving southern leader, fully embracing southern industries after war to create the “New South”. The authors used a variety of archival documentation: images, diary excerpts, letters, newspapers, city council minutes, textile mill records, oral histories and interviews from the Troup County Archives, National Archives, Atlanta, and the Atlanta History Center, among others. The life of Callaway opens up new avenues for researchers and provides archival documentation to a broader audience, both history buffs and scholars alike. Callaway as a biographical topic, until now, was infrequently covered; here his life is clearly defined. The contrast of Callaway’s life with the rise of modern Georgia demonstrates how the use of archival records can help to clearly illustrate individual and historic events. The GHRAC Awards recognize outstanding efforts in archives and records work in Georgia.The Georgia Archives is a unit of the Board of Regents of the University System of Georgia and identifies, collects, manages, preserves, provides access to, and publicizes records and information of Georgia and its people and assists state and local government agencies with their records management. This work is done within the framework of the USG’s mission to create a more highly educated Georgia. Henry "Hank" Huckaby, USG chancellor, and GHRAC Chair Toby Graham presented the award.